Faded paint, faded wood, faded glass even, dusty with years of grime, so much that this image looks nearly monochromatic, the only coloring offered by the iron oxide from the old nails. It’s that old carriage house in my neighbor’s back yard again. There’s just something I always find so inspiring in its details and it often becomes the subject or the backdrop of photos; it’s on my walk from my home to Main Street so I see it nearly every day. Here’s a view of the Black and White Barn and in Bird on a Fence. Just barely caught at the peak of the roof of my neighbor’s old barn catching the details and crisp shadows at the top, softening to dusk at the bottom. 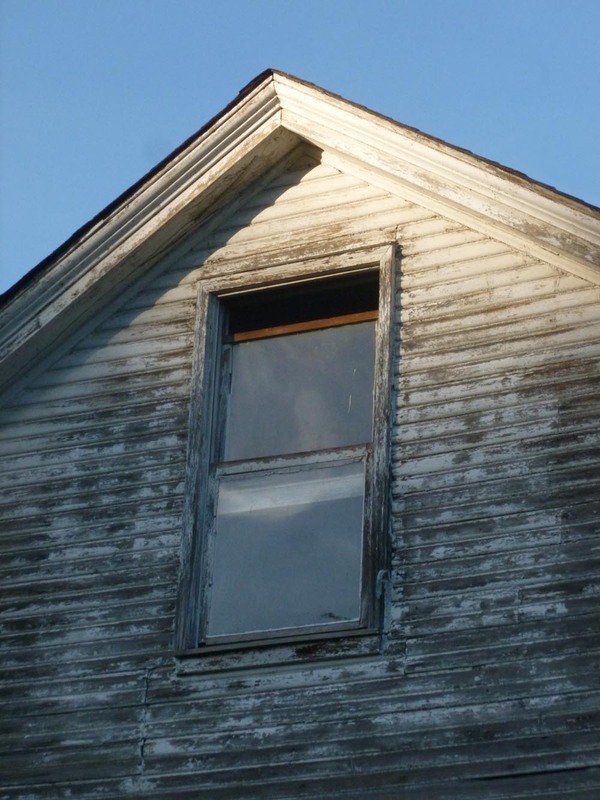 The window is slipping, letting the world inside. The morning glory vines I’d photographed a few weeks ago twining around the rusty wrought iron fence were now blooming, so I took my camera to photograph on a walk through the neighborhood to Main Street. However, I had forgotten to change the settings on my camera, which were on fully manual and set for low light photographs, probably my black cats looking out the window in the morning. All was not lost, however, as I like the effect of the faded but clear areas in the fence and the leaves, and the rather vivid violet in the morning glories, but all the washed out areas where the white barn and light-colored pavement were reflecting the mid-day sun and it just overpowers all the detail. I’m back to that old white barn in my neighbor’s back yard. Each year morning glories grow at the corners and they always look fresh and new, no matter the color. 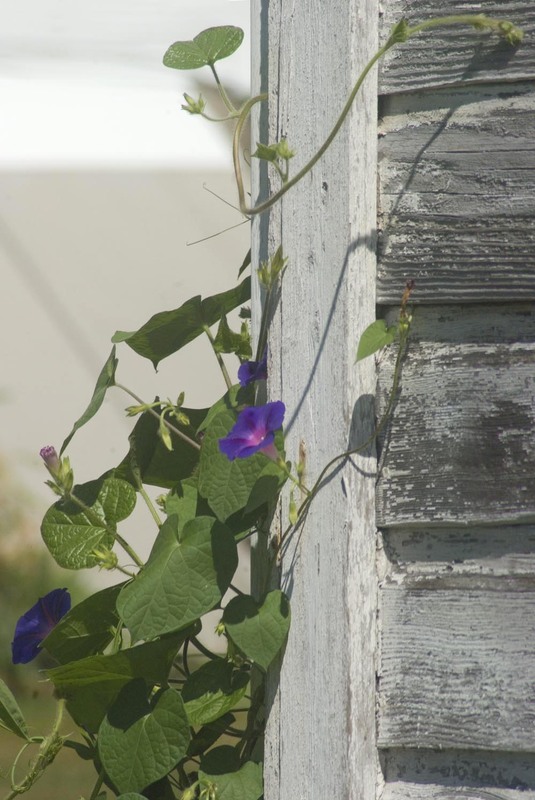 The graceful vines and shapely bright green heart-shaped leaves along with the vibrant purple flowers look delicate and sweet clinging to the weathered boards with peeling white paint. Another huge clump grows at the corner where the fence meets the building, and I’ve had my eye on that since it started twining on the fence, waiting for the flowers to bloom. I went there this morning to catch them in full sun but before the flowers closed for the day, but it’s been so dry they were wilted. I tossed my bottle of water on their roots and I’ll hope for a better outcome, a little earlier tomorrow morning. 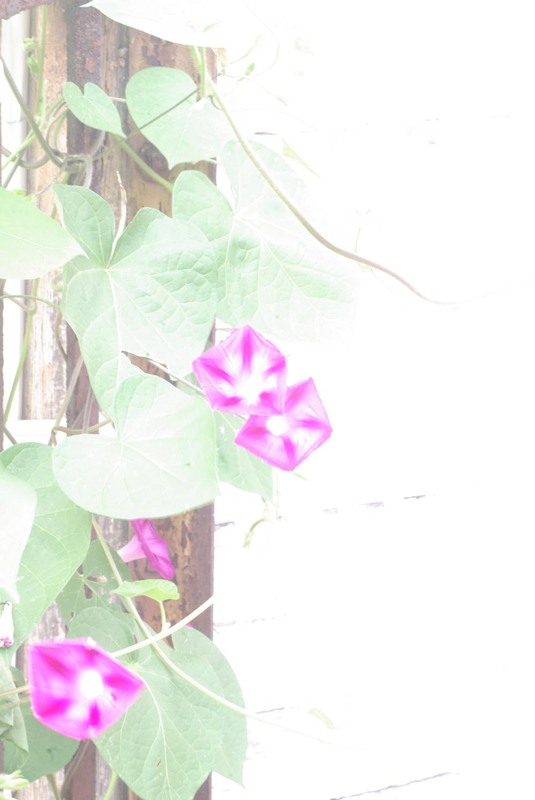 See other photos of my neighbor’s barn, and other photos of morning glories. Watching birds land and leave and land and leave in a popular bird spot can be mesmerizing. I thought I’d capture the starling in monochrome. Why, on a lovely green and gold summer morning, I’d imagine this old barn in black and white, especially when I loved the way all the green around it reflected on the peeling white paint and broken windows. But the details were so clear and varied—tiny details, large areas of darkness or light, regular patterns and lighter patterns, it was just very interesting to look at. And it’s not really a barn, at least not any more. It was long ago when the house was built, large enough to accommodate a horse stall and a carriage or two with a loft above for hay. Now it’s just an old garage with a planting shed tacked onto the front. It’s what’s in the background of the acrylic painting I featured today, “My Neighbor’s Laundry”. But the old barn provides hours of interest for me in all weather, and lots of photos and sketches. This is what it looked like today! This could be anywhere, but Carnegie really is a place where people still use their backyards to hang laundry. And it really is my neighbor’s back yard on a lovely summer morning. I originally painted this for my home town’s annual art exhibit “Carnegie Painted”, and it was one of the very first acrylic works I’d painted since high school, but I could see the colors, see the canvas, see the texture of the paint and off I went. Interestingly enough, this is a small portion of a larger painting. There was a neat old barn of a garage behind it, but I just couldn’t work out the colors right but I loved the laundry, so I cut this out of the panel and framed it. I sell this as a signed digital canvas print of an original acrylic painting, gallery-wrapped on wooden canvas stretchers with black paint covering the sides, ready to hang or frame as you choose. The original was 6″H x 12″W, but canvas stretchers are difficult to find smaller than 8″ so I just make a slightly larger print and gallery wrap it. I can also make an original size print and wrap it around a piece of 1/2″ gatorboard. I can also make other size prints as well. You can find this 8″ x 16″ canvas print in my Etsy shop.